India has set ambient air quality standards for several pollutants. According to the rules of the Central Pollution Control Board (CPCB), the annex monitoring agency, the national ambient air quality standards (NAAQS) should be met for at least 98 per cent of the days in a year. They may exceed the limit only for 2 per cent of the time, but not on two consecutive days of monitoring. But air-quality monitoring carried out in at least 263 cities shows that the majority do not meet standards. Further, pollution levels continue to rise in many cities, even smaller ones. According to the World Health Organization (WHO) data, 13 out of 20 of the most polluted cities are in India. The few cities that have moved forward could do so because of bottom–uppressure catalysed by public campaigns and judicial interventions. This hasraised a critical question: Is the legal framework for national air-quality planning in India inadequate and so weak that it does not allow time-bound compliance with the NAAQS? 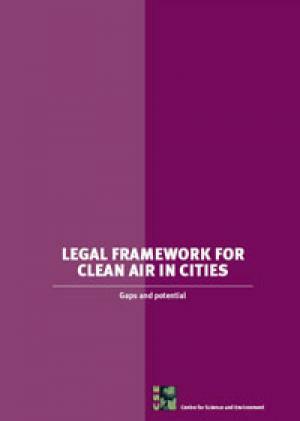 In other words, there no clear operative planning framework to ensure that all regions comply with the ambient standards. Further, when a city / state exceeds norms, the reporting requirement on non-compliance with a plan of action is also absent. We know from other countries that legal terms are well defined for cities and states to comply with the ambient standards. For instance, in Europe the Air Quality Directive sets limits for the levels of various pollutants and corresponding margins of tolerance and time limits for compliance. Each EU country is required by the Air Quality Directive to define ‘zones’ and 'agglomerations' to which pollutant limits will apply. Article 13 imposes an absolute obligation on member states to ensure that the limits and margins of tolerance for air pollutants are not exceeded in any zone or agglomeration after the deadline. In USA, it is mandatory to prepare a state implementation planto achieve NAAQS in non-attainment-status cities. In Australia, the standards are legally binding on each level of government. China is a new entrant to set clean-air targets to refine action plans.